Iraqi Prime Minister Nouri al-Maliki insisted Wednesday that his country is a front line in the war on terrorism and said those behind the rampant violence there are perverting the Islamic faith. "I know some of you question whether Iraq is part of the war on terror," al-Maliki told a joint meeting of Congress, where some lawmakers have been critical of the new Iraqi leader's position on the current conflict between Israel and Hezbollah militants. "Let me be very clear," said al-Maliki, speaking through a translator. "This is a battle between true Islam, for which a person's liberty and rights constitute essential cornerstones, and terrorism, which wraps itself in a fake Islamic cloak." Al-Maliki's speech was briefly interrupted (video) when a woman wearing a T-shirt with the message, "Troops Home Now," began shouting, "Iraqis want the troops to leave; bring them home now" in the chamber. Al-Maliki stopped his speech as police removed her, CBS News correspondent Bob Fuss reports. Some Democrats shunned the speech, while others later sharply criticized the prime minister for painting a "rosy" picture of Iraq, they said, and not condemning Hezbollah specifically. Rep. Steny Hoyer, D-Md., said not naming Hezbollah as a terrorist organization "adds ambivalence to his comments." Rep. Debbie Wasserman-Schultz, D-Fla., who did not applaud the prime minister's remarks, called al-Maliki's speech "disingenuous" because it did not acknowledge the violence in Iraq. Among those who did not intend the speech were Democrats Rosa DeLauro of Connecticut and Gary Ackerman and Nita Lowey of New York. Al-Maliki shook hands with several members on his way out of the chamber, including Senate Democratic Leader Harry Reid, who had sharply criticized the Iraqi leader on Tuesday for not condemning Hezbollah. Despite tough rhetoric against terrorism in the Middle East, al-Maliki did not mention the Hezbollah conflict. Al-Maliki's difference of opinion with his hosts over the two-week-old fighting had threatened to sour his visit. The Bush administration and its ally Israel insist that Hezbollah, which they consider a terror group, must be disarmed and defeated in southern Lebanon. European and Arab allies want a quick cease-fire to stop mounting civilian deaths in Lebanon. Al-Maliki heads Iraq's first permanent democratic government, and the Bush administration has a lot riding on his success. Al-Maliki emerged as a compromise choice to head the multiethnic government two months ago, after agonizing delays sapped the momentum and enthusiasm generated by successful free elections. Roughly 127,000 U.S. troops are in Iraq, but the administration is under increasing pressure from Democrats — and some Republicans – to bring a substantial number of them home by the end of this year. Congress has approved nearly $300 billion to try to secure and rebuild the country more than three years after a U.S.-led invasion toppled dictator Saddam Hussein. Al-Maliki and President Bush had lunch Wednesday with U.S. troops at an Army base near Washington. 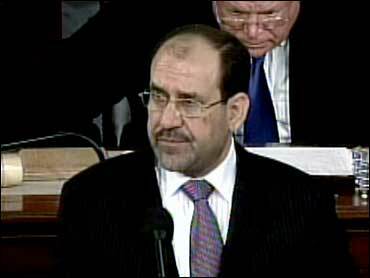 During his address, al-Maliki appealed to Congress for more aid, from the United States and other nations as well. He noted that much of the money provided so far has been spent on security instead of much-needed reconstruction. "There needs to be a greater alliance on Iraqis and Iraq companies with foreign aid and assistance to help us rebuild Iraq," he said. Al-Maliki said his country has made great strides despite the threat of extremists he said are bent on destroying Iraq's nascent democracy. "Above all they wish to spread fear," and represent a threat to all free countries, he said. "Iraq is the battle that will determine the war," he said. His words echoed those of Mr. Bush, who frequently asserts that Iraq is a central battleground against terrorism elsewhere, including on U.S. shores, and that the country can be a bulwark for the spread of freedom in the autocratic Middle East. Of his people, who have faced violence and death as the country makes a transition from the Saddam's rule, al-Maliki said: "They have stated over and over again, with the ink-stained fingers waving in pride, they will always make the same choice." Before al-Maliki's address, leading House and Senate Democrats said they were incensed by al-Maliki's position on the Israel-Hezbollah conflict. Al-Maliki has condemned what he called Israel's "hostile acts" in Lebanon and said the international community has not done enough to stop it. The White House criticized lawmakers who said they were unhappy with al-Maliki's comments on the Middle East conflict, CBS News White House correspondent Peter Maer reports. Spokesman Tony Snow said al-Maliki has the "right to his opinion," adding, "The president is not a puppeteer in this case. He's not pulling the strings of Prime Minister Maliki." The House and Senate last week overwhelmingly approved resolutions in support of Israel, which began heavy attacks on Hezbollah sites in Lebanon two weeks ago after Hezbollah forces crossed into northern Israel, killed eight Israeli soldiers and captured two.